Q. How can I create a permalink to an article? To create persistent URLs (or permalinks) to an article, database, or search results list so that other MSU users can view it from both on and off campus can be done, but it is a somewhat complex process. These links could be used within Desire2Learn (D2L) and on other course pages. It is complex because each publisher may need a different process, and it will not work at all for some. For links to articles, look for a “bookmark,” “persistent URL,” or “permalink,” link, and then just add the proxy prefix. For example, in InfoTrac PowerSearch and related databases, look for the Bookmark this Document link. Then add the proxy prefix above to the front of that long URL for the permalink. In Academic Search Complete and other EbscoHost databases, look on the Citation screen for the Share button and then the Persistent link box. 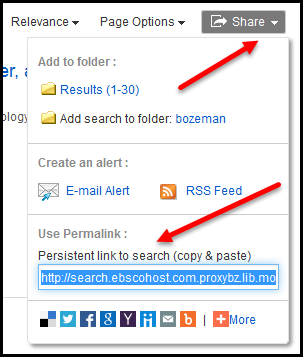 The proxy prefix is NOT NEEDED since it is already embedded in the Permalink on EbscoHost databases. In JSTOR, look for the Stable URL. Then add the proxy prefix above to the front of URL for the permalink. In LexisNexis, it is difficult, but once an article is found, try using the Durable Link Tool. See also the video tutorial.